The crimson finch, sometimes called the blood finch, is a common estrildid finch found in New Guinea and northern Australia. There are two established subspecies; the nominate black-bellied, and the white-bellied neochmia phaeton evangelinae. They are rarely kept in aviculture due to their reputation for aggressive behavior, their short lifespan, and their high price. Crimson finches can be housed as single pairs or as part of a mixed collection. 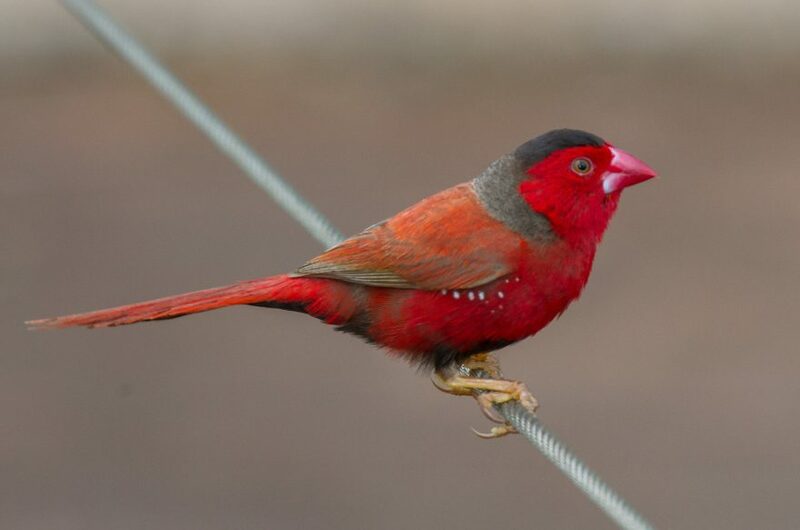 Crimson finches are a territorial species, so only one pair of crimson finches should be housed in each aviary. They may be aggressive towards other birds with red plumage, especially in smaller aviaries without sight barriers. Large, sparsely-populated aviaries are the key to successfully keeping and breeding crimsons. Although uncommon, it is possible for crimson finches to hybridize with red-browed finches, plum-headed finches, and star finches. Ensure that there are no unpaired birds if these species are to be housed together. Crimson finches are prone to illness in cold weather. The aviary should be designed to protect them from wind, rain, and temperature extremes. The aviary floor should be kept dry at all times. Crimson finches love to bathe and should have access to clean bathing water throughout the year, but especially during summer. A quality finch seed mix including canary seed and various millets forms the basis of the crimson finch’s diet. Seed lacks many essential vitamins and minerals which must be compensated for by introducing other foods. Sprouting seed increases its nutritional value and is a cheap way to improve your bird’s health. Freshly grown green seed heads should also be offered frequently. Some leafy greens should be provided throughout the year. Kale, bok choy, endive and silverbeet are the most nutritious and will be readily eaten. Spinach can also be given, but only sparingly as it can contribute to calcium deficiency. Live food is an important component of the crimson finch’s diet and should be provided throughout the year – especially during the breeding season. Mealworms, maggots, termites, and small crickets will be consumed readily. Commercial soft finch food mixes can also be provided for an added nutrient boost, particularly when breeding. Crimson finches breed best in spring and autumn, with a hen bird that is at least 12 months of age. They prefer to nest in a shrub or dry brush, however a budgie-sized nest box will be acceptable if a natural nesting location cannot be provided. Crimson finches will not tolerate nest inspections. They typically lay 4-7 eggs in each clutch, which are incubated by both parents for approximately 14 days. Young birds fledge the nest at three weeks of age and are usually independent about three weeks later. It may be necessary to separate independent young from their parents to control aggression. 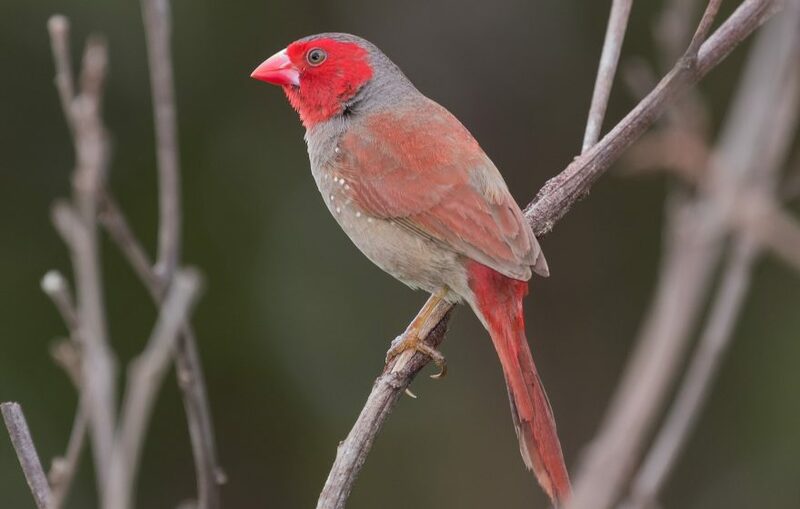 While male crimson finches are almost entirely red, females finches have a grey breast and belly. A strict worming and parasite control regime is essential to ensure the long-term health of any finch collection. Crimson finches are a short-lived species with a lifespan of 5-6 years. Crimson finches will spend a lot of time foraging for insects on the aviary floor, making them more susceptible to parasites and diseases that spread via droppings. Regular cleaning and preventative healthcare is a must.